"We ordered through you because we knew you’d expedite the order as requested – and you did!" Tags are an excellent way to label your items with information. Some have the option of unstrung or strung. Combine unstrung retail price tags with tagging guns to quickly attach price tags with fasteners. At American Retail Supply our tags are either blank or pre-defined form. Price tags with pre-defined form organize information. Whether you need simple retail price tag for apparel or service tag for dry-cleaning, American Retail Supply has it. Choose either multiple colors or just plain white for Apparel price tags. Whereas, service tag is in manila color with extensive more information then need for apparel or jewelry. However, form price tags might not be enough to describe your product or service tag is just too much, that is where blank price tags come in handy. 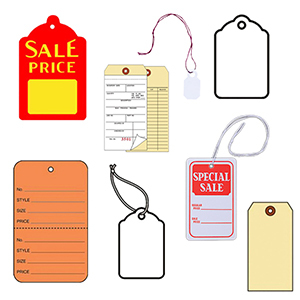 American Retail Supply has three types of blank Price tags; Tag with scallop design, manila blank tag, jewelry tag with string, or sale price tags. White, Manila, or bright red with yellow print "Sale Price" are some blank sales tags. They give you the freedom in writing what you need and not constraining you like pre-defined form tags. We have many designs that could fit your retail store. Our jewelry tag and scallop tags are good examples of some that are different from most retail price tags. Our jewelry tags come as small oval to octagon shape; all ranging from less than an inch. Scallop tags have a scale design on top of the price tag. Otherwise, if you don’t need anything unique, we have regular rectangle price tags too. If you choose to do a custom retail price tag you can select your shape, color, size, border and string color. Custom options are available in printed, hot-stamped and embossed. Call us at 800-426-5708 to let us know exactly what you want your tag to look like.